There are an estimated 650,000 family (aka unpaid) caregivers in San Diego County, and if the national averages hold true here, about 90,000 of those are caring for former or current military personnel. San Diego is a long-time military city, offering many resources for veterans and their caregivers. 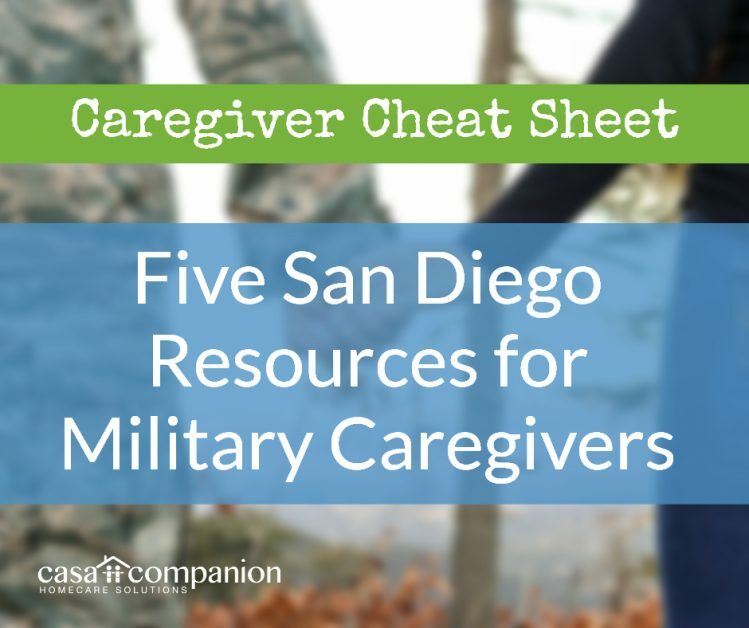 Here are some useful resources available in San Diego County specifically for military caregivers, home care aides and loved ones. The Legacy Corp is a service group that provides free respite care to family caregivers for veterans of any age. Military family caregivers can schedule respite visits from a Legacy Corps member who has been interviewed, undergone a background check, and completed orientation. The program’s mission is to help relieve stress and lighten the load of caregivers in military families. Corps members must be 17 or older, and do not have to be former military themselves. This program was founded by the Rosalynn Carter Institute for Caregiving, based in Georgia, and is run in San Diego by the Southern Caregiver Resource Center. Operation Family Caregiver (OFC) supports family caregivers who are caring for veterans, especially those with post-traumatic stress disorder and traumatic brain injury. The program’s coaches, licensed clinical social workers, will assess caregivers’ needs, then create and deliver a custom coaching and support plan. San Diego has four OFC coaches, and offers training, workshops, support groups, and respite as well. Or check your eligibility here, and call 1-877-222 VETS (8387) for help with the process. The Defense and Veterans Brain Injury Center (DVBIC) serves veterans and service members with Traumatic Brain Injury (TBI) and their family caregivers. Caregivers and medical providers supporting a TBI patient can access the DVBIC’s caregiver tool-kit, clinical white papers and fact sheets, and other educational materials. The DVBIC’s The Traumatic Brain Injury Recovery Support Program (RSP) assigns patients and caregivers a Recovery Support Specialist who helps them navigate the medical and non-medical services available to them, both through the military and locally.